Join Us for the Launch of SafeTogether - Child & Family Connections, Inc.
We warmly welcome you to join us for a “Gathering of Friends & Colleagues” to raise awareness about a groundbreaking new program SafeTogether to reduce custody loss in Philadelphia’s families living with parental mental illness. Thursday, May 11, from 6-8 p.m.
We can head off the trauma of custody loss in many families living with parental mental illness by keeping children safe, in the home, and out of foster care. 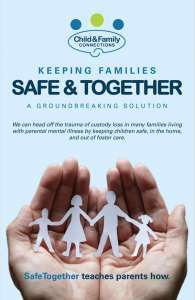 SafeTogether teaches parents how to create a legally-binding family plan that ensures a responsible adult is caring for the children in the home and that the parent is receiving effective and appropriate psychiatric care so the family can soon return to everyday functioning. Parents establish an integrated support team of friends, family, and health professionals with defined roles and responsibilities. Children who are developmentally appropriate are involved in aspects of the plan design and creation. Philadelphia has the highest child removal rate of any major city in the U.S. In 2015, Philadelphia had just over 4,100 children in child protective custody. Today there are more than 6,100, a 50% increase in the child placement population. Pennsylvania spends more than $1.7 billion on child welfare services. It conducts 66,417 investigations at a cost of $44 million. No, this event is not a fundraiser. We certainly appreciate donations but that is at your discretion. However, we are always appreciative of people who can volunteer, join a committee, become a board member, and an ambassador for CFC. If any of this appeals to you come find anyone with a CFC name tag. This is an opportunity to get together with colleagues and friends—those we know and those we hope to soon know—in a relaxed venue with great food and drinks. We are also excited to tell you about SafeTogether and hope to get your input. Who is Child & Family Connections? We are a small 501c3 nonprofit here in Philadelphia. Child & Family Connections improves the lives of families living with parental mental illness in meaningful ways—through peer-informed education, advocacy, and support. As many as 70% of parents with a mental illness lose custody of their children even when the court has found no evidence of neglect. SafeTogether is a pilot program that will keep children in the home and out of foster care when a parent is symptomatic or in crisis. Here’s a 1-page program brief. No cost. You are our guest and the event is free. There will be lots of hors d’oeuvres and a cash bar. We haven’t met before, why was I invited? You were recommended to us as someone we should meet. Many, but not all, guests are involved in behavioral health, the nonprofit sector, and/or public service space. We hope you’ll join us. Can I bring a guest (+1)? Yes, you may bring one guest. Please let us know your companion’s name in advance. I don’t have my invitation. How can I RSVP for the event? Parking is free at the Chart House. SEPTA also picks up and drops off at Penn’s Landing nearby. You can email the event chair, Patty Burke. Do I need to bring my invitation to the event? No, it is not necessary. Please RSVP in advance and you’re all set.